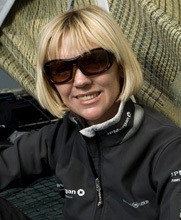 Double Olympic Gold medalist Shirley Robertson MBE has turned to catamaran sailing. 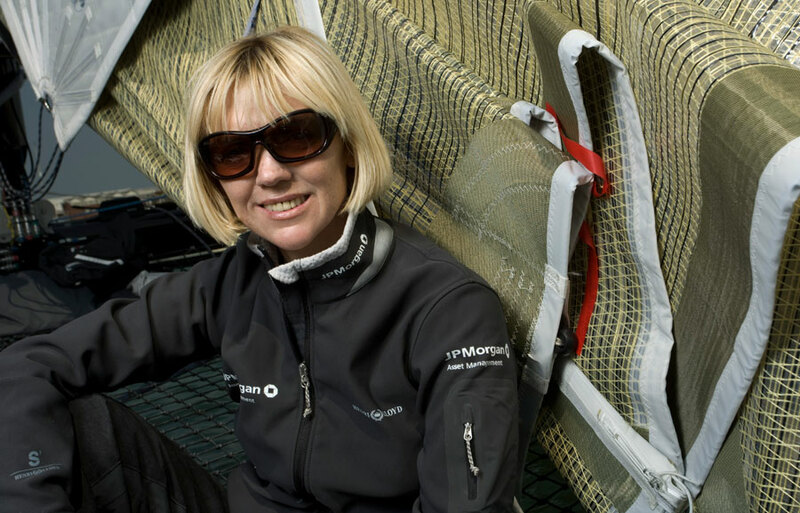 After helming in a couple of 2007 iShares Cup events, she took over the JP Morgan Extreme 40 for the entire 2008 series. Marian Martin met up with Shirley in Hy�res, France and asked her how she was finding this different kind of sailing. The boats you won your Olympic Gold medals on weren�t exactly scintillatingly fast. How did you feel the first time you took the helm of an Extreme 40? Shirley Robertson: I think you�re right; I�ve spent my whole life going pretty slowly, so it was a big change going to sail catamarans. First time ��.. yes, I was apprehensive and I didn�t want to fly too high, but you quickly get to do it. It�s amazing that the first time it�s all a bit scary and the next day you�re seeing how high you can fly. So, yes it�s very different and in some ways very enjoyable for me, because I spent so long doing a very similar sort of sailing and it�s nice to step into something that�s completely different. Is there a point when flying a hull changes from exciting to �I�m frightened�? SR: It�s not so much just sailing the boat, it�s much scarier when we�re racing, because you lose your escape lanes quite quickly, because of the other boats. Also, when we sail so close to the shore, as we always do that can be scary; it�s not like sailing in the Solent, where we always plan an escape. You can�t do that racing and, in these cats, there is only one way to escape and if that�s blocked there�s nothing you can do and that�s when it gets scary; that�s what happened to Alinghi in Lugano, we�re all travelling pretty quickly and there�d be a big smash if we hit. Watching the racing yesterday, you all seemed to be more tolerant. I saw situations at roundings where I thought there would be flags waved, but it didn�t happen. SR: Yesterday wasn�t really racing, we were having a bit of a practice, so you�re right everyone is very tolerant. It will be different today when we�re actually racing; although, everyone is aware of what it�s like to sail the boats and there is an understanding between the teams, but it�s pretty aggressive when we start racing. These 40s seem to usually capsize sideways, where the ORMAs seem to often pitch pole. SR: We do both; the easiest capsize is sideways, because that happens relatively slowly and you can either drop down onto the sail, or climb over. The scariest is when we pitch pole and we�re most likely to do that on a bear away, or when there are waves. I get the impression that these boats tend to fly a hull higher than most multis when going up wind. Is that right? SR: Well I�m no catamaran expert, but as a class we do like to show off; there�s definitely an element of that. How fast do they tack? They look pretty quick to me, but how many boat lengths do you lose? SR: Like all catamarans you lose a lot and, in some ways, these are worse because they are quite heavy. You don�t want to tack unless you have to. This series seems to have taken off, whereas the ORMA is dying. Why do you think that is? SR: I think this is a tremendous concept. We really embody the whole corporate sailing & corporate entertainment. There�s an ethos of providing that and, if you�re going to get a sponsor, you have to be able to provide that and I think these events service it very well. It�s corporate entertainment to a very high standard and, although we�re racing, we�re also there to provide a bit of entertainment. Everyone really understands that and I think it�s one reason the event is so successful. Also, it�s relatively straightforward; it�s a one design and you can just buy a boat and do it. It�s not cheap, the campaigning is quite expensive, but I suppose it�s a lot less than something like the ORMA. How does sailing fit in with family life? SR: I�m just a working mother and, whether I�m sailing or doing my day job, I just make it work like everyone else. With the travelling I do very much rely on family support; there�s two grannies there at the moment. It would be very hard if I didn�t have that family support, because I�d worry about them. When are you going to start them sailing? SR: They have been in a boat, but I�m not in a panic, I think sailing is one of those activities you can do all your life, so I�m not in a hurry. I live on an island and I want them to feel comfortable about it. Extreme 40 sailing looks rather physical. How do you keep fit? SR: It�s not so physical for me, but it is for the guys especially as we do these tiny short courses. When they�ve finished a race they can hardly breathe, even though they do aerobic training. With these short courses everything happens so fast, there doesn�t seem to be time for tactics. How do you plan things? SR: There is a big difference; when you sail slower boats there�s often a discussion. You weigh up all the information and you might even discuss it within the crew. With these boats that�s rare and a lot of it is instinct. We plan a bit before hand, because we can see the course and even sail it a couple of times, but in the end it�s a bit like a computer game where you�re trying to avoid one situation and there�s a whole load of others waiting to kill you. You can never relax. Why do you think you did so well at Lugano, up against people who�ve been racing these boats a lot longer? SR: I think Lugano conditions were quite specific, we only had one really hard race and the rest were very light. We took advantage of our opportunities and tried no to get involved with everyone else and we got pretty good speed, so it worked out for us. There are very different conditions here and I don�t think this is our strength. Also, when I was Olympic sailing it was practice, practice, practice, then practice practising. Generally, we don�t get a lot of Extreme 40 practice, we just have to learn as the event goes on and the teams that will be in front at the end will be the ones that have learned from the racing and progressed. What�s the next thing for you? For this year, this is the only sailing I�m doing. I work in television and I have a family so it�s enough for this year. Next year, I might do something else, but I don�t know; I spent 20 years sailing every day and this is fine. I love the racing, it�s the most fun I�ve had sailing � ever, on anything, and I�ve sailed on some pretty big monohulls. I really enjoy this and they�re a great bunch of people as well and you really have to work together. Also, it�s not just one long race a day, so you progress quickly and I enjoy that. The learning curve is steep, but I like that.